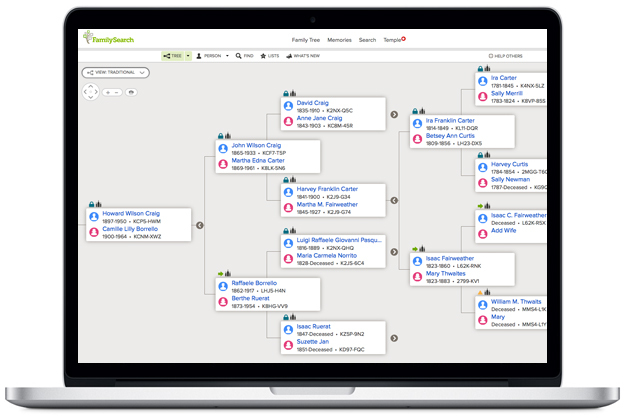 The Church’s “Family Tree” website is command central for your family history. It’s the site you use to submit your family names for temple work. And, it’s much more…as you’ll see below. 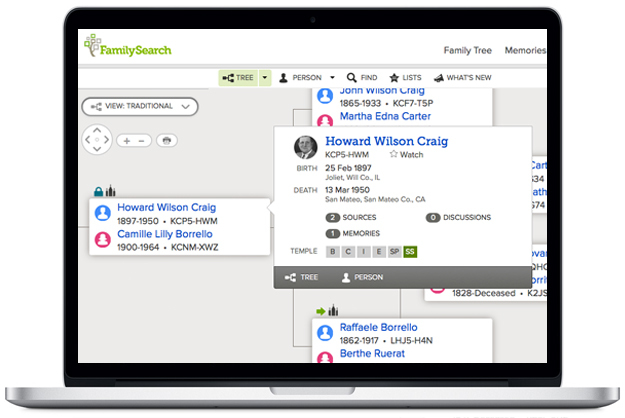 Easily see several generations of your ancestors at one time and identify the places where more research is needed. At a glance, see who’s temple work is not completed. Easily navigate your ancestral lines. See the person’s portrait photo if one has been uploaded. See the number of sources, discussions, photos, and stories attached to this person. See the person’s name and basic events. See the ID number (beneath the name) which identifies each person in the system. To display this person in the main position on Family Tree, click Tree. To display the person’s details page, click Person. To display the person’s sources, click Sources. To display the person’s discussions, click Discussions. To display the person’s photos, click Photos. To display the person’s stories, click Stories. To watch the person, click Watch. To unwatch the person, click Unwatch. See, add, edit, and delete the person’s name, gender, events, and other details. See the ID number (formerly called the person identifier). This number identifies each person in the system. It appears directly beneath the name. See the person’s family members. Click the name of any person in the family to display his or her summary card. Add new spouses, children, parents, and siblings. See, edit, and delete information about couple and parent-child relationships. See, attach, detach, and edit sources about the person. 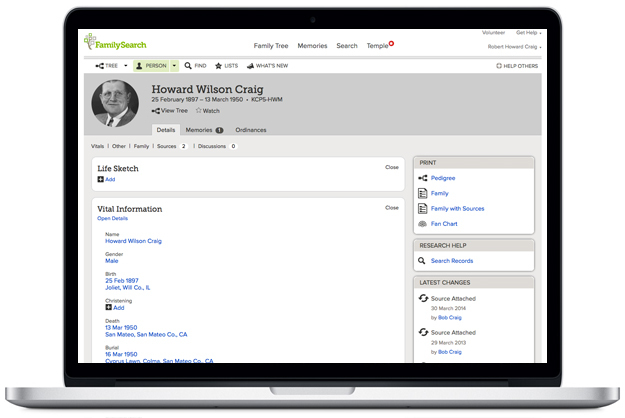 Search for the person in the historical records on FamilySearch.org. Watch the person so that you can receive notifications when information about him or her changes. See a history of the changes that were made to the person’s information. See how many discussions have been added and when the last activity occurred. Return to one of the last 50 people whose information you viewed previously. See and merge duplicate records. Print a pedigree chart and family group record. Delete the person from Family Tree. So, now that you’ve got a quick overview of what Family Tree is and does, let’s get some temple work done!